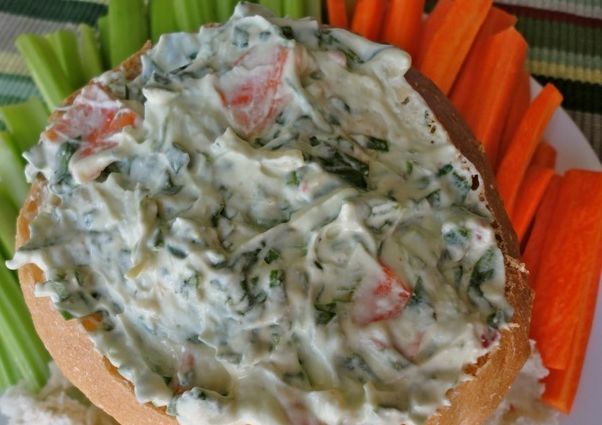 We love this dip! I've served it at several Super Bowl parties and the bowl is always licked clean. No, it isn't quite like the cheesy-oily-fatty-weird-gloppy Spinach Dip from the deli but it's definitely very good, in fact, it's better! Blend the cashews until smooth, adding only enough water to blend them as smooth and creamy as possible. Add next seven ingredients and blend until smooth, adding only enough water for all the mixture to go through the blades easily. Pour into a mixing bowl and add remaining ingredients. Taste and add salt and pepper if desired. Chill 2-3 hours. Serve in a hollowed out bread-loaf if you want - use as a dip with veggies or chips, or spread on crackers or bread. It's good in sandwiches and wraps with sprouts and such too! These look delicious! I'm heading up a vegetarian class at our local library, and several people were wanting quick and easy recipes, and this definitely looks quick and easy. I'm going to be trying them soon, so I can take them to our next meeting. One thing I'm sure the group will be curious about, though, is how well these freeze for later. Have you tried freezing them? I don't usually make dips, but this is a good one to bookmark for those special occasions when we have guests over and snacking is a must! Okay, now we are talking! YUM! I think adding some artichoke hearts to this would be even more fantastic! AFTER they are baked, they will freeze just fine. Freeze on a cookie sheet until solid and then transfer to a ziploc baggie. To thaw, just place in a single layer in a 9X12 baking pan and cover with sauce of your choice and heat, covered with foil, for about 45 min. Take foil off and continue to heat until sauce evaporates a little, if you want.